Honestly, both Danny and I felt that your work is exemplary. It's just great to work with you because you're professional and your people skills are good. You have good taste in general, which gives you a certain "class" -- something we were looking for. I heard about Alpheus through a common friend and I dug into his pictures online ! I did not need much time to choose him ! His pictures speak for themselves. They turned out so well and today when I look back at them it gives me so much joy and immense satisfaction, thanks to Alpheus for capturing the flavour in a subtle and a classy manner ! I would strongly recommend Alpheus to one and all !! He is one of the few genuinely best photographers out there. The pictures feel just as relaxed and fun as the day we had. I would easily recommend Alpheus for any occasion that needs a professional, friendly, and stylish photographer. Alpheus, the pictures are great. Can't thank you enough for giving us such awesome, life-long memories. You really did an amazing job. Thank you once again. 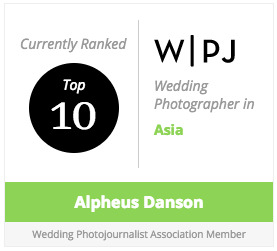 Alpheus was recommended to us by another photographer. He was able to take advantage of all the lighting and decorations we had at the mandap. We have some of these photos framed in our house. Even if you are half a world away, getting in touch with Alpheus and sending him comments on photos so he can create a beautiful album is seamless. We would recommend Alpheus to our friends because he is that good.